The Slingshot Wakefoiler is the first production stand up hydrofoil board designed exclusively for riding behind boats, PWC's and anything else that can tow you across the water. This innovative product is designed to bridge the gap between wakeboarding and SUP. 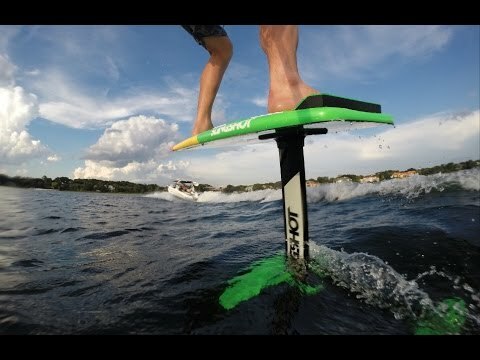 Hydrofoil technology has come a long way since the days of the Air Chair and Sky Ski. As the foiling craze explodes in surfing, windsurfing, kiteboarding and stand up paddling, it’s only natural that wakeboarding gets its own version. The Wakefoil is designed for easy learning and user-friendly progression. The foil provides lift at low speeds and has a bottom-heavy weight balance that promotes stability and easy handling. Check it out in action in the clip below.